When I was a teenager, I promised myself if I ever cured my acne, I would share my knowledge with others. But I was waiting for that day to come for a LONG time. My acne was stubborn. I was depressed and I hated looking at myself in the mirror. I rarely took any photos when I was a teenager, especially on days when my skin was inflamed. It’s just within the past few years, that I’ve managed to finally find a cure for my acne. I recently shared a photo for the #10YearChallenge and many of you told me that I actually look younger now than I did 10 years ago. That’s a HUGE compliment for me. Because when I was a teenager, it felt impossible to imagine a day with clear skin. 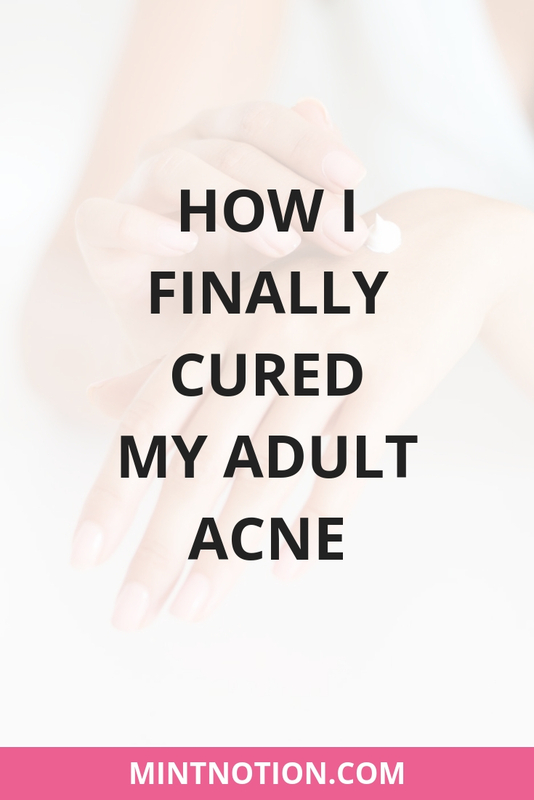 Today I’m excited to finally share how I managed to cure my adult acne, improve my skin texture, and have healthier skin. Left side: 19 years old, experimenting with natural skin care. 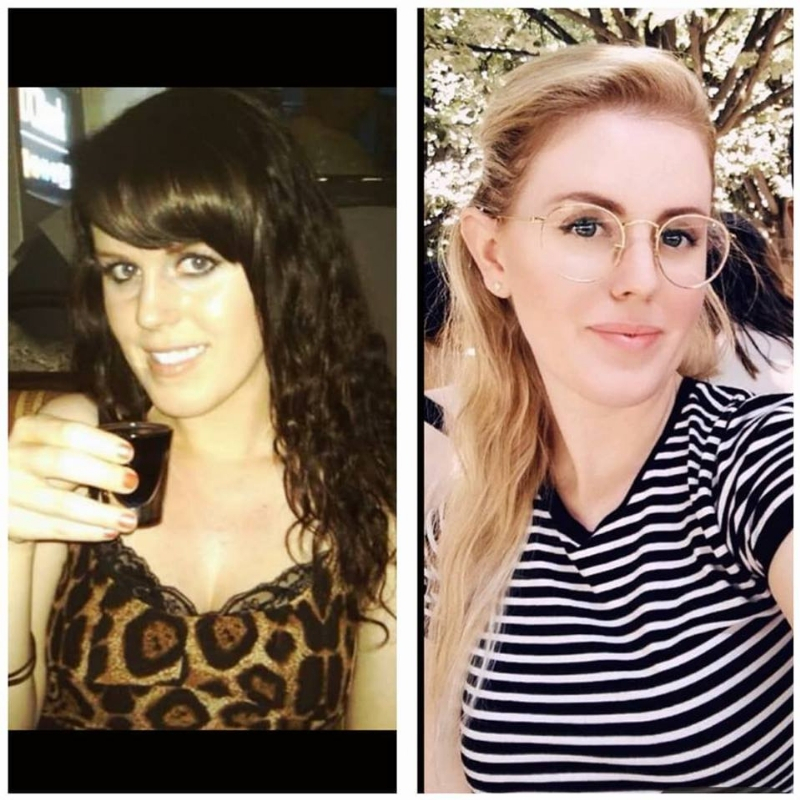 Right Side: 29 years old, finally cured my adult acne. My skin type: Oily and sensitive in the summer. Combination and sensitive in the winter. My acne type: Whiteheads, blackheads, papules (under the skin’s surface), and pustules (pimples). I started getting acne when I was 12 years old. I know it sounds superficial, but having acne during your teenage years and as a young adult can destroy your self-esteem. I was desperate to do anything to have clear skin. My mom took me to several different dermatologists to determine the cause of my acne and a possible solution. By the time I was 17, I felt like I tried everything. Retin-A, Differin, Benzoyl peroxide, Tetracycline, Oral contraceptives, chemical peels, Proactiv, and so on. It was exhausting! I will also mention I did not wear ANY face makeup while I was in highschool. Sometimes I would wear eyeshadow and mascara, but I didn’t wear face powder, blush, bronzer, or foundation. Result: Many of these prescription creams left my face looking red and the antibiotics bothered my gut. None of these dermatologist recommendations seemed to help. During college, I started doing my own research and focused on natural solutions to cure my acne. I stopped using harsh products on my skin and switched to a gentle cleanser, started eating healthier (less processed foods and sugar), and began taking more vitamins (cod liver oil, vitamin C, and zinc). I also started using argan oil on my skin as a night time moisturizer. I was initially afraid to put oil on my skin because I already had oily skin, but the argan oil helped balanced my skin’s sebum production. In highschool, I was trying to strip away my natural oils by using harsh creams and scrubs, which was only exacerbating the problem. Argan oil contains vitamin E, which can help remove damaged cells and help new ones grow. This was helping my skin fade dark marks, scars, and keep it hydrated. I was also getting more exercise during college and noticed a huge improvement in my skin. Result: My redness went away, my complexion was clearer than before, and I was feeling more confident. I followed this natural skincare regime for a few years because it was keeping my skin about 80% clear. I would still get the occasional breakout, but it was a significant improvement from my teenage years. I truly believe there’s no one miracle face product that can cure acne. Based on my personal experience, acne starts from within. A holistic approach is necessary to cure acne. This involves a healthy lifestyle shift. For years, my main focus was what I was putting ON my skin to heal my acne. Now I focus on my lifestyle (exercise), diet (healthy eating), and personal care products. After using natural skincare during college, I became more aware of the ingredients found in my personal care products. I switched to products which contained more natural ingredients and avoided chemicals whenever possible. This includes my shampoo, conditioner, deodorant, body lotion, and so on. One ingredient I try to avoid is parabens. They can be found in many personal care products. Parabens have a chemical structure similar to estrogen, which means they can mimic the effects of this hormone in the body. Because they can influence your hormones, this can contribute to acne. Studies have also shown parabens are linked to the increased risk of breast cancer. Before using a new personal care product, I like to do a quick search on EWG’s website. This site has helped educate me on which ingredients are safe and which ingredients to avoid in my personal care products. I highly recommend checking out these tips for safer products. Result: I have finally cured my acne. By focusing on a healthy and holistic lifestyle, my pores have gotten smaller, my face is less red, and I rarely experience a breakout. I have learned almost everything I know about skincare and how to properly apply skincare products from Dr. Neal Schultz. I’ve been following his YouTube channel and website for the past 10 years. Even though he hasn’t released any new videos in awhile, he has a TON of great information available on his website. I highly recommend checking out his skincare tips. Disclaimer: I’m obviously not a doctor. 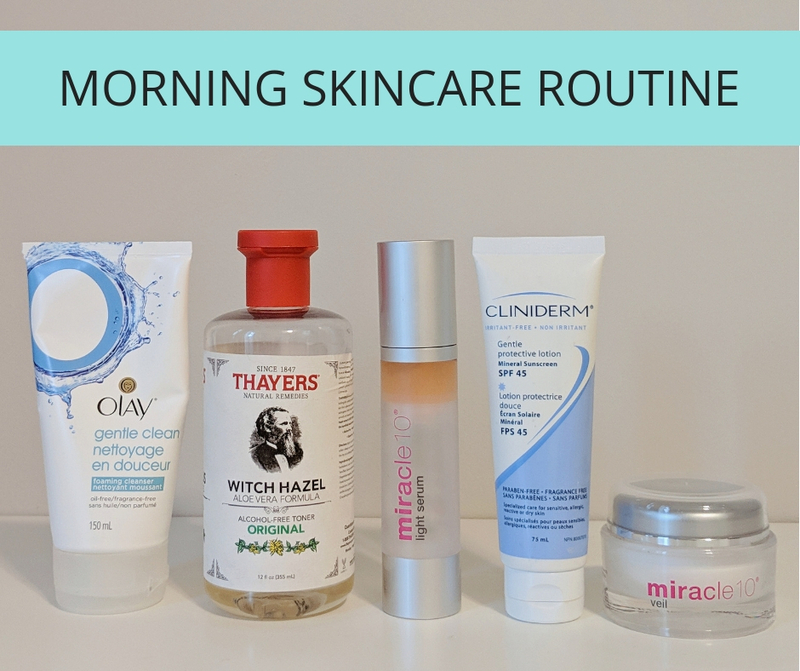 I’ve been following the same skincare routine for the past 5 years with great success. The products I use are not always the cheapest. However, I save money because I know they work for me and I don’t have to experiment with a bunch of different things anymore. I hope you’ll find this information helpful! My skincare changes slightly in the winter and summer months, due to the extreme weather we experience here in Toronto. I’ll make note of which products I use in the summer and which products I use in the winter. I recommend washing your face with a gentle cleanser and lukewarm water. I wash my face AFTER my shower. Hot water can dehydrate your skin and cause broken blood vessels / broken capillaries. This is why I don’t recommend washing your face in the shower or using hot water to steam your face. Product Recommendation: I have been using the Olay Gentle Clean Foaming Face Cleanser for sensitive skin for the past 10 years. It’s not a natural product, but it works great for my skin. Product Application Tips: Splash face lightly with lukewarm water. Apply face cleanser with your finger tips in a circular motion. Pay special attention to problematic areas, such as your forehead, nose, chin, and jawline. I usually do this for 30-60 seconds, then rinse thoroughly with lukewarm water, and pat dry with a clean, soft towel. Many people think you put toner “on” before applying other products. Toner is not something you put “on”. The toner is used to remove things from the skin. Toner is the second step in fully cleansing your face. It removes dirt, oil, makeup, and even face cleanser that you missed in Step 1. Product Recommendation: I have been using Thayers Natural Remedies Witch Hazel Toner for the past 10 years. It’s affordable, gentle on my skin, and can help manage acne. Product Application Tips: Spritz toner on a cotton pad and gently swipe it over your entire face, neck, and chest. Toner should be used AFTER washing your face and BEFORE applying any other products. I ONLY wear sunscreen if I plan on spending time outside during the day. If I’m working at home and don’t go outside, I won’t apply sunscreen. While you can get sunburnt during the morning or late afternoon, the sun’s UV rays are at their strongest between the hours of 10:00am and 4:00pm. As per Dr. Neal Schultz’s recommendation, I apply my sunscreen first, before applying my moisturizer. The reason why I used a separate sunscreen and moisturizer (instead of a moisturizer that contains SPF), is because I don’t like wearing sunscreen if I’m not outside. You can watch Dr. Neal Schultz’s video here sharing why you should apply sunscreen first. Product Recommendation: I have been using Cliniderm Gentle Protective Lotion SPF 45 for the past 10 years. It’s a physical sunscreen (chemical-free). It dries semi-matte and I’ve never gotten a sunburn when wearing this, even when I was out all-day hiking in Utah’s National Parks. Note: While I am happy with Cliniderm’s sunscreen, it can be hard to find and sometimes it’s out of stock. I am trying to find a new physical sunscreen (mineral-based) to use instead. If your skin is sensitive or acne-prone, physical sunscreens are often best suited to this skin type. This is an ingredient found in many chemical-based sunscreens. It’s an endocrine (hormone) disruptor in humans and has the potential to damage cells which may lead to skin cancer. This ingredient is a form of vitamin A and is found in some sunscreens. Studies have shown retinyl palmitate can encourage the formation of malignant and potentially cancer-causing cells in the skin. Avoid choosing a sunscreen with SPF values greater than 50. You can read this article for more details on why high SPF sunscreens may not be good. Product Application Tips: Sunscreen is applied AFTER toner and BEFORE applying other products to my face. I put a pea-sized amount of sunscreen on my finger tip, then dab it around my face. Then I gently rub in the sunscreen until it fully absorbs in my skin. You can watch Dr. Neal Schultz’s video here sharing how to apply chemical-free sunscreen. After applying sunscreen, I then apply my daytime moisturizer. I ONLY use a daytime moisturizer in the winter (colder months) or when my skin feels dry. This means I rarely use a moisturizer in the summer (warmer months). It gets very hot and humid during the summer in Toronto and my skin is oily. I don’t need to apply a moisturizer in the summer. You can watch Dr. Neal Schultz’s video here on moisturizers and acne. Product Recommendation: In the summer months, I just use my sunscreen if I’m spending time outdoors. If I’m indoors and feel my skin is dry, I apply a light serum. I have been using the Miracle 10 Light Serum for the past 5 years and love it! I’m not partnered with Miracle 10, but I wish I was! They are the BEST skincare products I have ever used. My whole family uses Miracle 10 and they love it. I even got my boyfriend using Miracle 10 too! You can save 10% off your next order with this referral link. In the winter, my skin is normal / combination. I apply a daytime moisturizer to hydrate my skin. I have been using Miracle 10 Veil moisturizer for the past 5 years and love it. I don’t wear primer, BB cream, or foundation on a regularly basis. I only wear these products if I’m going to a special event. The only face makeup product I wear everyday is a tinted face powder which matches my skin tone. This helps combat shine and evens my skin complexion. I don’t wear a lot of face makeup because I believe in investing in quality skincare products instead. If you have good skin, you won’t need to wear much makeup. I don’t use anything fancy to remove my makeup. Any type of micellar cleansing water and makeup remover will do. I wet a cotton pad and gently remove my makeup. I wash my face the same way as per my morning skincare routine. Product Recommendation: In the evening, I switch between my Olay Gentle Cleanser and Miracle 10 Cleanser II. This means every other night, I will use my Miracle 10 Cleanser II. I’ve been using this cleanser for the past 5 years and love it. It contains antioxidants and 1% glycolic acid, which gently exfoliates my skin. I follow the same toning method as per my morning skincare routine. According to Dr. Neal Schultz, there are 3 essential skincare products everyone should use for healthy skin. These are sunscreen, exfoliants, and antioxidants. Sunscreen helps protect your skin from the sun during the day. Exfoliants helps your skin look healthier and younger. It can also help with acne. Antioxidants can reduce oxidative stress by reducing free radicals. They can reduce wrinkles, brighten your skin tone, and can help prevent skin cancer. For antioxidants to work effectively, it’s best to apply them only at night. You can watch Dr. Neal Schultz’s video here to find out why you should only apply antioxidants at night. Product Recommendation: For my antioxidant, I currently use the Miracle 10 Super C. This is 100% pure Vitamin C antioxidant powder. I’ve been using this for the past 3 years and love it. My skin actually looks brighter the next morning after using it at night. For my exfoliant, I like to use either Miracle 10 AHA Cream or Miracle 10 Retinol 30. I use the AHA Cream during the week and the Retinol on the weekend. This is just my personal preference and what works best for my skin. I don’t recommend using physical exfoliants, especially if you have acne-prone or sensitive skin. Chemical exfoliants perform much better. You can watch Dr. Neal Schultz’s video here to find out why chemical exfoliants are better than physical ones. Product Application Tips: I follow the instructions as per Miracle 10 suggests. I mix 1 part Vitamin C powder with 4 parts AHA Cream. I don’t use it on nights when I use Retinol 30. On evenings when I use Retinol 30, I skip the Vitamin C.
NOTE: There is no strong evidence that you can’t combine both AHA and Retinol. However, many dermatologists recommend not using them together at the same time, as this can weaken their effectiveness. I personally find they irritate my skin when using them together. This is why I use them on separate nights. Do you need to use both AHA and Retinol? Both products remove dead skin cells and promote cellular turnover, which is good for reducing acne and improving skin texture. AHA tends to be milder and gentler on my skin, which is why I use it more often than Retinol. Studies have also shown that Retinol can help repair damaged skin tissue and rebuild collagen, something which AHA doesn’t do. Because exfoliants can be drying to the skin, I always apply a moisturizer AFTER putting my exfoliant and antioxidant on. Product Recommendation: I use the Miracle 10 Veil as my evening moisturizer. This is the same moisturizer I use during the day in the winter. If my skin feels dry or like it needs extra moisture, I apply a facial oil under my moisturizer. I have currently been using Kiehl’s Midnight Recovery Concentrate for the past year and love it. However it can be expensive, so I will probably switch back to my Argan Oil after I use up the Kiehl’s product. I don’t have a favorite eye cream at the moment. I’m currently using a product I found on sale at the drugstore, which is just okay. It does a good job of moisturizing the area, but it hasn’t reduced the appear of dark circles. Reduce dairy products. I used to love dairy, but dairy products never loved me. They bother my stomach and every time I eat cheese or yogurt, I wake up with pimples the next day. Now I drink almond or coconut milk. Reducing dairy products in my diet has made a significant improvement in managing my acne. Plus, after doing research, I found out dairy products are not healthy for humans. Less processed and deep-fried foods. During highschool, I used to eat white bread and cheese almost every day. I also ate a lot of chips and processed snacks. No wonder my face looked like a pizza! Eliminating soda, processed, and deep-fried foods has helped keep my acne under control. Reduce sugar intake. Once I began to eat less processed foods, I was naturally reducing my sugar intake too (because there’s lots of sugar in processed items). But, I also have a HUGE sweet tooth and love cookies and cakes. I now limit eating dessert to once per week (usually on the weekend) and this helps keep my acne away. Eat more greens, fruits, and vegetables. Spinach is rich in vitamin A, which can naturally manage acne. It also contains chlorophyll, which helps cleanse toxins from your digestive tract. Eating more dark, leafy greens can help fight off acne, plus it’s good for your body. An easy way for me to get more greens into my diet is by having green smoothies. I have green smoothies about 3 times per week. I like to add flaxseeds to my smoothie for omega-3. Drink green tea. Drinking green tea can help your skin produce less sebum, reduce inflammation, and boost your immune system. These are all powerful anti-acne agents. Drink more water. I know this sounds silly, but many of us don’t drink enough water each day. Staying hydrated can help flush out toxins and maintain clear skin. Add lemon, lime, mint, or cucumber to make your water more exciting. Just drink more water. Curing acne involves a holistic approach. Here are some lifestyle changes I made which helps beat breakouts. Exercise regularly. Working out can help reduce stress and improve your mood. Exercise also increases blood flow, which can help nourish skin cells. To avoid breakouts after sweating, I always wash my face after exercising. I usually workout in the morning right before I have a shower. Get plenty of sleep. Getting at least 8-9 hours of sleep each night can help keep your immune system functioning optimally, which can help manage acne. Clean cellphone regularly. Your cellphone is dirtier than a toilet seat. To keep these germs away from your face, I recommend wiping your phone clean with a 60% water / 40% rubbing alcohol solution. Wash your pillow case often. I change my bedding every weekend. This helps keep my pillow case clean and prevents acne. Use a non-toxic detergent. Some laundry detergents contain pore-clogging ingredients. Your skin can absorb these ingredients while you sleep. I currently use Ecos Laundry Detergent, which is safe for sensitive skin. Wash makeup brushes regularly. Makeup brushes are hotbeds for bacteria, which can clog your pores. I recommend washing them once per week. I like using this makeup brush cleansing mat. This helps to deep clean your brushes. I have naturally fine and curly hair. I’ve been using Live Clean shampoo and conditioner for the past several years and absolutely love it. Other shampoos and conditioners have clogged my pores. I love the smell of Jason Body Wash. It comes in a big bottle, which lasts a long time for me. The Rosewater is my favorite scent. After using many different natural deodorants, this one worked the best for me. It’s more expensive than regular deodorant, but it’s worth the cost to avoid aluminum and parabens found in antiperspirant deodorant. The Rose + Vanilla and Lavender + Sage are my favorite scents. I used to buy lotions from Bath & Body Works, but those products are full of toxic chemicals! I love EO body lotions because they smell amazing and they’re fast-absorbing. I never feel greasy after applying these body lotions. They are gentle enough for my sensitive skin and strong enough to protect my skin during our harsh Canadian winters. I use coconut oil for oil pulling. Maintaining good oral hygiene can help cure acne. Oil pulling can remove bacteria in your mouth before it gets to your gut, which can lead to a healthier body and skin. If you made it this far, thank you SO much for reading. I hope you found this post helpful. I know this seems like A LOT of information and it can be a little overwhelming to process everything right now. 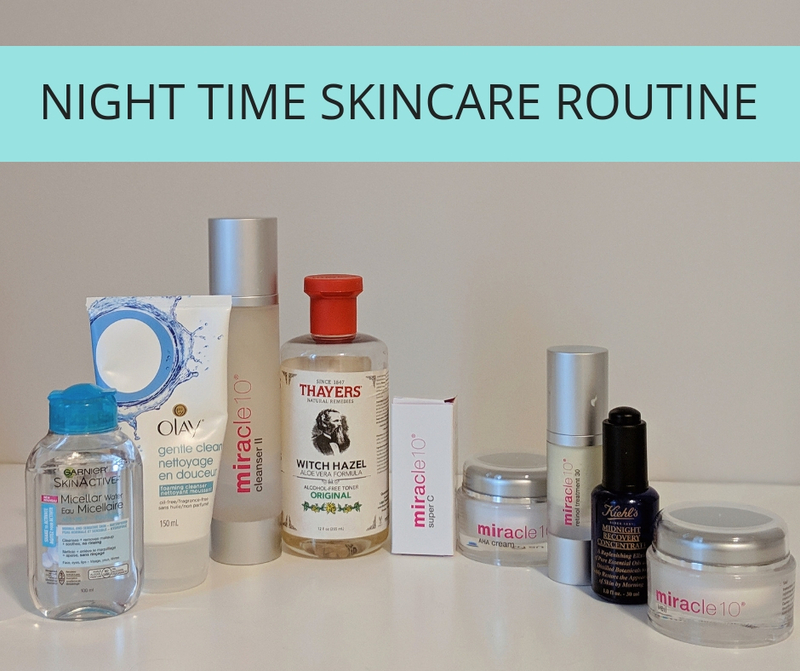 For me, this has taken years of trial and error approach, talking to different dermatologists, experimenting with different skincare products, and doing my own research. Everyone is different and there is no one “miracle” cure for acne. For me, it’s taken a holistic approach, including eating healthier, exercising regularly, using the right skincare products for my skin, and being more mindful of toxins in our environment. Pay attention to what you’re putting in and on your body. You don’t need to take my information as strict advice. I’m just sharing tips which have worked for me. Listen to your body and find a routine which works best for you! It is a amazing the difference clean, gentle products can make on your skin. It’s wonderful to learn of the success you’ve had with you skin treatment regimen. It certainly damages your self-esteem when you have acne and other skin issues. Thank you for sharing your story! Thanks for reading Kelly and the recommendation for a new sunscreen. I will have to look into it! Lots of great advice! I’ve been on my own skincare journey and getting a routine in place over the past couple of years. My skin has improved so much. I’ve also switched to only cruelty free products. Still haven’t delved too far into chemical exfoliants though. Thanks for reading Jess! I’m happy to hear that you’ve found a good skincare routine that works for you. Thanks for sharing those resuable pads, that’s a great idea! This was such a helpful post! Thank you! It’s amazing how important application is, too! Thanks for reading Heather! I’m so happy you found this post helpful! Thanks so much for this post Eden! I absolutely loved it. I feel your story is quite similar to mine, since my skin type is the same.